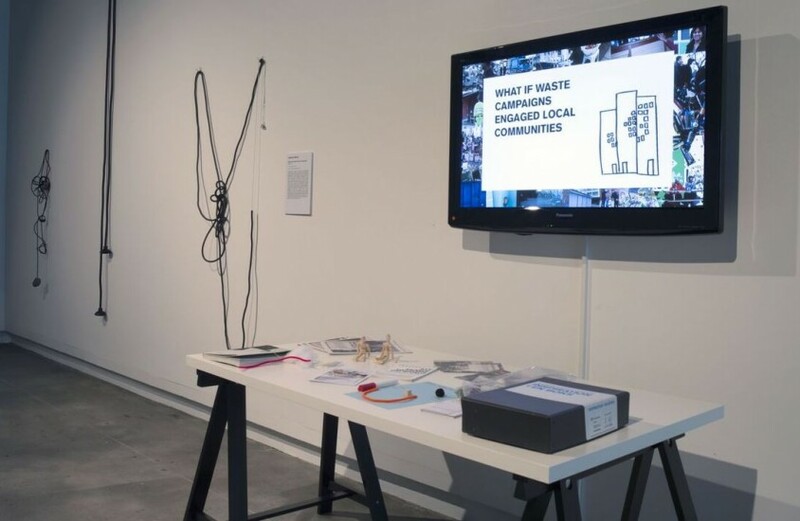 Experimental Thinking/Design Practices exhibition is the third in a series of exhibitions, the first of which was held in Sydney at the University of New South Wales. The second was hosted in Melbourne by RMIT at the Design Hub in May 2015, and the third is at QCA, Griffith University, South Bank Campus. Katherine Moline is credited as the head of a curatorial team, and in Brisbane she was joined by Peter Hall and Beck Davis. These curator talks performed a significant role in the experience of the exhibition in its localised site variations. However, there were other curators involved in the shows, floor talks, workshops and the catalogue essays. Collectively, the show provided a wide range of installations and exhibits in gallery settings that were linked together by experiments in the practice of design. Significantly, they were all concerned with the processes of design and experimental thinking. The exhibits demonstrated that prefixes are not always appropriate: The word Design is so often prefixed by descriptors such as graphic, web, or interior. Here the designs were speculative and often provisional which enabled the word Design freedom to roam across categories and disciples in various trajectories. For example, on entering the exhibition space, there was at your feet, literally, an Autonomous Kinetic Poetry Robot built from a vacuum cleaner and a few computer parts. Easy to enjoy as a little interactive machine that bumps its way around the walls and feet of anybody close; like a puppy it’s cute – but also writes poetry. Other exhibits engage with various communities – both national and international, on issues that relate to sustainment and disaster management for example. In some cases, more time needs to be taken by viewers to understand what the concerns of the exhibit are. In this regard, the floor talks were useful in giving a narrative thread to the exhibits. So was the informative catalogue which complemented the floor talks and showed the ways in which we might see the works more clearly. There was also discussion during the floor talks about how the exhibition might reach out to other, wider audiences. Connectivity and co-design were integral to the theme in the exhibition, but how these inventive ideas about design as process, not things, connects with a political community still remains a work in progress. The exhibition closes on Saturday 7 November 2015. For more information go to Experimental Thinking/Design Practices.